Most of bloggers use this word to convince readers to subscribe : subscribe !! A week and a half ago I had a sudden realization. Subscriptions generally cost money. Think about that for a second. It’s jarring, especially if you’ve spent the past few months or even years incessantly asking your readers to subscribe. The percentage of readers who misunderstand what you mean when you ask them to subscribe is largely dependent on your niche. Readers who know what RSS is probably aren’t confused by the terminology, but most web users have no clue about RSS. I’ve found that a good measure of reader savviness is a blog’s split between RSS and e-mail subscribers – the higher the percentage of RSS subscribers, the more savvy the readership. I write a blog about entry-level jobs for new college graduates. Despite what you might think of the younger generation, the vast majority of my site’s visitors are not familiar with RSS. 55% of my subscribers get my daily posts through e-mail. They think of paying to get something. I use Google Analytics’ outbound click tracking on my blog so that I can analyze the subscription behavior of my readers. This method misses RSS subscriptions from the address bar, but the people who subscribe in that way are probably the most savvy readers and are basically irrelevant to this case study. The above graph shows the trend in clicks to my RSS feed and e-mail subscription buttons for the 8 days prior to the change and the 8 days after the change. My subscription rate has increased 254% since I made the change, and 66% of the new subscribers are e-mail subscribers. This is in line with my hypothesis that the people who misunderstand the word “subscribe” are the same people who will choose e-mail over RSS. Although they may not be web savvy, these readers are extremely valuable. It is essential in all copywriting that you avoid unclear jargon, even if it’s not jargon to you. OK, so I haven’t proven that my readers actually associated the word “subscribe” with paying money. The only way to prove that is by surveying readers. But I believe I have shown that very small changes in word choice based on well-thought-out theories can have a significant influence on the actions that you urge your readers to take. Whether or not my theory on the connotations associated with the word “subscribe” is accurate is irrelevant. It’s results that matter, and changing one word on my blog has given me outstanding results. When readers visit my site, I now invite them to “Get Jobs by E-mail.” Brian encourages readers to get “E-mail Updates,” and he did this way before I submitted this article to him. Most of us use Blogger.com to start their free blog which may be for making money or sharing your knowledge, voice through blogging. But if your blog is not Search Engine Friendly than you can not archive your goal. For this purpose you need to make your blog fully Search Engine Optimized and add meta tag to blogger so that people searching their keywords will easily knows your site. 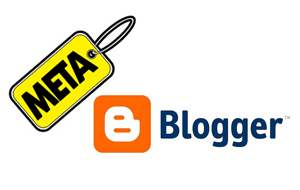 Just follow following simple steps to add meta tag to blogger. To add your own description, title, keywords. Please replace all above words with your desire words! as shown below. your blog is full Search Engine Friendly. If you face any problem. Just Drop your comment. I will be able to help you about blogger Search engine optimization. If you are searching for free .edu website to build b backLink, I invite you to read this article (How To Get Free EDU BackLinks) and get A list of free .edu backlink providing sites to increase your rank. .EDU Backlinks are incoming links to a blog or website from .edu sites or blog that whav e power to increase your ranking in google and alexa. backlinks from other then .edu site have also power but the power of .edu site will break all simple site and boost your ranking. Usually, edu sites are colleges or universities and they only link to valid resources and google trust them ,so if you get back links from this site that’s mean your site is doing good. How To Get Free EDU BackLinks For your Blogger blog? there is a tricky way that you can find a edu sites by searching in Google with these terms. Just copy the below lines and paste it in Google Search Engine, then start opening from No-1 and start buliding backLinks to get higher ranking. How To Get Free EDU BackLinks? 1.) Just Open The Following Links. 2.) Register Or Comment On These. 3.) Fill Your Correct Information With Your Site/Blog Link. 4.) Visit You Link On Second Day And Ping It. 5.) Your Site/Blog Is Ready To Rock. We can do blogging offline with this software. With growing technology like Windows Live Writer blogging is no more limited to your dashboard. You can write, save and publish posts right from your computer without signing in your blogger account. Blogger HTML editor lacks many features when it comes to writing a good looking post. On contrary windows live writer is a software built by Microsoft Corporation which contains every feature that Blogger lacks. I hate blogging without Windows Live Writer! I am sure many bloggers would agree with me on this point. You can not write HTML code just the way it looks in blogger editor because the code is interpreted as a command and blogger editor converts it to how it may look in a browser. You can’t resize an image to whatever size you like because you are provided with only three options i.e Small, Medium and Large size. The font type and font size is limited. You can not undo what you have done (Going backward). You can’t align images to the left or right of your intro paragraph. You can not add effects to your images, like shadow effect, rounded corners, emboss, blur etc. So go and download it right now by clicking the link below. DOWNLOAD WINDOWS LIVE WRITER NOW! Which is best WordPress or Blogger? which blogging platform to choose to start your blogging career? The major blogging hosting platforms are no doubt Blogger and WordPress. Now to judge which one is better I have written a detailed comparison chart below that will be of great help in making a smart decision. Image storage limit 1 Gigabyte With Picasa Web Albums 3 Gigabytes. More space can be gained through upgrade. 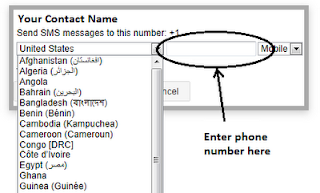 Send FREE SMS With Gmail To Any Mobile In Any Country? Amaizing trick : Short Messaging Service is great! It is fast, it is cheap, and it is convenient! Not to mention verypopular especially among the youth. It lets you connect with your friends and family no matter where in the world you are. 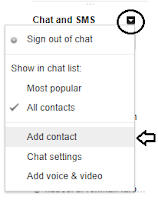 A few years ago, Google launched its SMS chat service via Gmail. But then it withdrew the service and took it back to its lab. This service was relaunched some time back, but was limited to very few countries, like U.S. etc. Well here's a good news! Google has, very recently, introduced updates to the service. 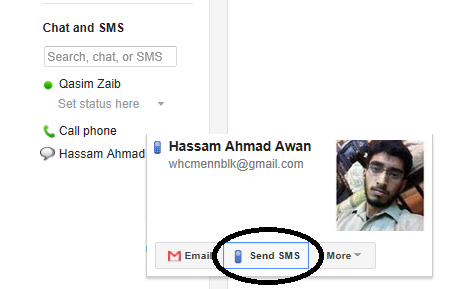 Gmail SMS messaging is now available across a lot more countries, including Asian countries such as Pakistan, Afghanistan, India etc. You can now send texts to a lot of networks in many countries,absolutely free! Google does not charge anything for this service. However, since this is a new service to most countries, some carriers might charge you for it. 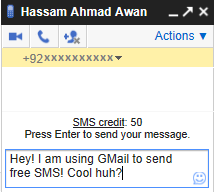 Usually, you won't be charged for sending SMS through Gmail. The receiver might be charged a small amount if he chooses to reply to that message. Otherwise, standard messaging rates apply. 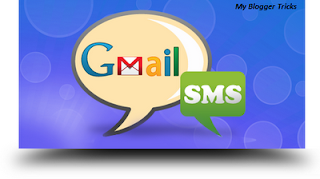 Read more aboutSMS Charges at the Google Chat Support page. 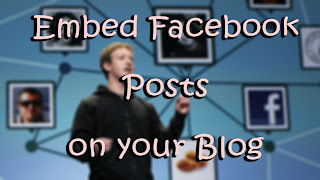 Embed Facebook Posts in Blogger. Social media has taken the web by storm, and is now increasingly being integrated with various services.Social recommendations have now become a lot more important then they were a few years ago as compared to organic search, which goes on to show that the way the average internet surfs is changing. And it's no wonder that every social network wants you to share its content all over the web. For that effect, Facebook, following into the footsteps of YouTube and Twitter, has launched embeddable posts, which will enable blogs and websites to share status updates, pictures and videos that are on Facebook. Sharing your Facebook posts on your blog page cold could help with the engagement on your site. But before you can embed a post, that particular post needs to be public. Posts with restricted privacy settings won't be embeddable. So if you're trying to embed your own post, make sure it is Public first. Now, there are two methods to embed posts. The "Embed" option within Facebook posts, and the Facebook Configurator tool. Both these methods will generate a code that can be embedded on any platform or website, and not just on Blogger. Facebook is introducing this option within Facebook posts. If you click on the little drop-down arrow next to a post, you will see an "Embed post" option sitting there, among other options. If it's a photo, you'll see an Embed button underneath the photo where you normally find the Download and Delete options. Once you click on that button, Facebook will give you an embed code which you can add anywhere. Although this is the easier way (apparently), Facebook is only slowly rolling it out to profiles and page. Right now, only about 5 Facebook pages have received this option, including Mashable, CNN, The Huffington Post etc. So for now, it doesn't have any real use. And that is what most other blogs will tell you. But what they won't tell you about is the second method, with which you can embed any post! In my opinion, this is the easier option. But it involves a bit more work. You first have to grab the URL of the Facebook post you want to embed. For photos, you can easily get the URL by clicking on them. But for other media, it isn't as easy. At least it doesn't appear so at first. To get a post's URL, simply click on its timestamp (see below). Copy the URL from your address bar, and then go to the Facebook Configurator tool. Paste your URL in the field provided. Once your story loads in the tool, click on Get Code. You will get two code segments that look something like this. Now you can paste the shorter code segment in your source code wherever you want to display the Facebook post. Check out this post I've embedded from over our Facebook page. See how it works. Whoever said you need to go to online services each time you want to look over at the Search Engine Optimization of your website? SEO is not a one-time process. Rather, it's an on-going one, which might make going repeatedly online to different sites a drudging work. To make it easier, there are certain desktop SEO software that you can install right to your computer, and they will work in the background when you're not interacting with them, hence making ordinary tasks SEO tasks easier for you. Here are the 10 best desktop SEO software to optimize your website. Web CEO Professional is a complete Suite for webmasters, SEO professionals, and even search engine marketers. It integrates more than 12 different tools for SEO related tasks into a single workspace, From keyword research to building targetted traffic, and from finding a niche to performing site promotions on search engines, there's a lot you can do with this powerful SEO Suite. Traffic Travis is all about optimizing your site for increasing traffic. It is a comprehensive SEO software that will give you insights into your competitors, and will suggest ways to improve your ranking and come up ahead of the competition. It can be used to remove errors in your site, and to build quality backlinks. This is another great SEO Suite for professionals. Like Web CEO Professional, it also offers a lot of tools. But the primary use of iBusiness Promoter is analysis. Whether you want to do some keyword research, or analyze competitions, or simply want to track how well your keywords are doing, then iBusiness Promoter is for you. It will help you get into the first page of search engine results. Advanced Web Ranking can be rightly termed as a complete SEO Software. It provides a complete solution for managing all the SEO related tasks. It provides the most accurate and comprehensive keyword research tools, measures and improves search engine traffic as well as revenue, does effective link building and analysis, provides integration with Google Analytics, provides automated reports, updates and backups, and comes with complete data privacy and enhanced security and reliability. SEO Power Suite provides world-standard SEO software. It helps to improve the search rankings of your website on the search engines by doing proper keyword research and analysis, building quality backlinks, content optimization, and by doing other SEO tasks as well. SEO Power Suite comes in Free, Professional, and Enterprise versions. It provides powerful tools which make SEO tasks easy and effective and result oriented. Its toolkit includes tools such as Rank tracker, SEO SpyGlass, Website Auditor and LinkAsistant. SEO Elite offers a massive collection of traffic generating tools; reveals how a webpage ranks high in search engines, finds high PageRank sites, finds Super Affiliates, monitors reciprocal links on partner sites, backlink search, reveals how many and which pages each major search engine has indexed, regular updates of your search engine rankings, analyzes and compares special search commands on Google, reveals exactly which sites your competitors are advertising on, uncovers penalized sites you may be linking to, finds link exchange partners, and submit articles to article directories. You can make your site search engine friendly using Microsoft Free SEO Toolkit. 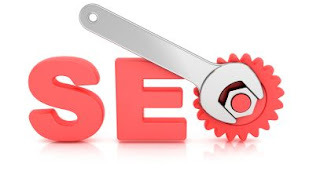 Free SEO Toolkit eases your efforts for search engine optimization (SEO). It can be downloaded for free. Free SEO Toolkit provides detailed analysis of your website and provides helpful suggestions to improve the overall relevance of your website in the search results. It helps you to grow your website traffic and revenue, controls the access and display of website content in search results, and improves the overall user experience as well. SEO Suite is one of the most advanced and powerful SEO Software which comes with more than 25 SEO tools delivering high quality website optimization. It combines Web Ranking Software as well as Dynamic Submission Software and has hosts of other useful features as well. It comes with Web Site optimizer, Link Building Tools, Reporting Tools, does keyword research and analysis and also monitors the rankings for keywords and does lots of other tasks as well. Screaming Frog is a SEO Spider software that lets you crawl a site or a link list quickly, scanning for target keywords and attributes, or checking for errors or inconsistencies. You can do a lot with this handy tool. And we demonstrated some of the ways you can use it in a previous post. Read the following post for more information.